Countless similar questions can be found on the internet. In view of this, many people have no idea about the best YouTube size to avoid black bars. 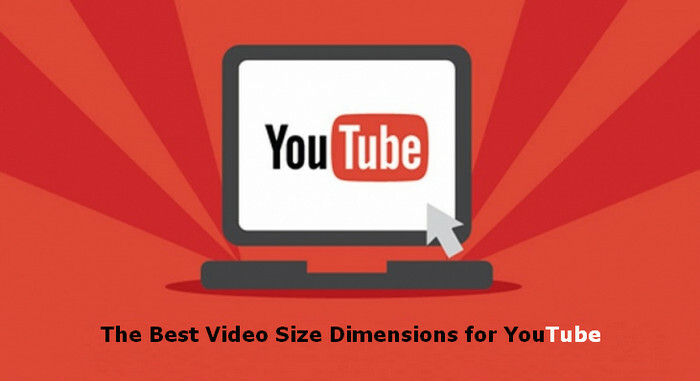 But luckily, you can find answers in this article which will focus on the best video size and size limit for YouTube video uploading, and introduce a program to convert video to the best video size for YouTube. * Crop the frame size or black bars of a video image, cut off unwanted area of a video. * Trim off some video segments if the video surpasses YouTube supported file size. * Split a large/long video to smaller parts for uploading to YouTube. * Change video aspect ratio from 4:3 or other ratios to 16:9 to fit for YouTube player. * Convert any videos to YouTube supported file formats easily. Millions of people around the world register on YouTube out of watching versatile videos, sharing favorite videos with friends and also uploading self-made videos to YouTube. Uploaded videos could involve travel recording, product introduction, how-to guide, promotional tour, etc. However, not all videos you upload to YouTube can deliver satisfactory viewing experience. Uploaded videos may always end up with black bars on the sides or low video quality. To rectify things like these, you need to figure out the best YouTube size. When uploading video to YouTube, it's necessary to check ahead if your video size matches with the requirements of YouTube video uploading. According to the rule, video file size is limited to 2GB for YouTube uploading. But size larger than 20GB is allowed by using an up-to-date browser. And the maximum is 128GB. Video frame size refers to video resolution. Since YouTube applies 16:9 aspect ratio players, uploading a 16:9 video file could be the best choice. The following resolution plans are the frequently-used ones. Above are the best YouTube video size dimensions for uploading. For those video files in 4:3 aspect ratio, YouTube player will automatically display videos with pillar boxes or letter boxes to play videos properly. This is why some YouTube users will find black bars on the sides of YouTube video. To fit for the YouTube player, make sure to set the aspect ratio to 16:9 when recording videos. WinX HD Video Converter Deluxe is a nice YouTube video editor and converter, capable of changing aspect ratio from 4:3 to 16:9, changing video resolution, cropping videos, trimming videos, merging videos into one, splitting video into parts and more, to upload a video perfectly fit for YouTube. Plus, it has premade profiles for YouTube, thus you can convert any videos to YouTube supported videos directly. To output high quality YouTube video, setting ideal resolution size isn't the only priority. Other encoding settings are not supposed to be ignored, including video format, bitrates, codecs, etc. Frame rates: It is recommended to make frame rates match the source material. YouTube supports up to 60 frames per second. Bitrates: Compared with other settings, bitrate is less important. For advanced users, you can refer to the tables below. How to Convert Videos to Best YouTube Video Size? The videos we attempt to upload to YouTube could be shot by mobile phones, tablets, cameras, webcam or ripped from DVD. Thus, output resolution size could be inconsistent with the best YouTube size suggested by YouTube. To get better result, you'd better change video size to the best YouTube dimension and set video audio parameters to fit for YouTube before uploading. Here's a professional YouTube video editor and converter – WinX HD Video Converter Deluxe which enables users to convert videos directly to YouTube compatible resolution size and format, crop/trim/merge/split video, set audio video parameters including video resolution, aspect ratio, video audio codec, frame rate, sample rate and bit rate, and so on. With this tool, you can directly convert video to YouTube in four simple steps only, thanks to the preset profiles for YouTube. Step 1. 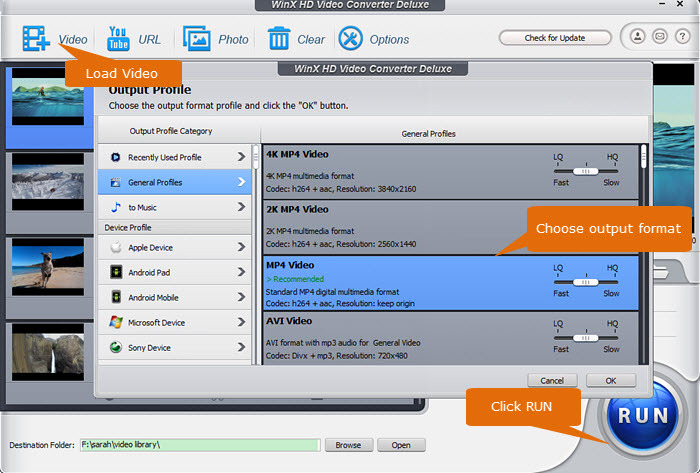 Open WinX HD Video Converter Deluxe, and choose Video. Next, load video by clicking + Video. Step 2. Choose output profile: go to Target Format, scroll down to YouTube Video, and then choose MP4 or FLV. MP4 is recommended. Step 3. Modify the video size for YouTube using the following ways: click Cut to delete unwanted segments: click Crop to remove unwanted area, such as letterbox; hit Codec Option button to change aspect ratio, resolution, frame rate, video audio codec, etc; go to Toolbox tab, click Split, and then divide the video into smaller parts for further uploading. Step 4. Set Output Folder to store the converted and edited videos. Hit RUN to begin converting videos to YouTube best video size for later uploading. Besides working as YouTube video editor and converter to get best resolution/file size for YouTube, WinX HD Video Converter Deluxe is capable of converting video to iPhone Xs (MAX)/XR/X/8/7/6s/6 Plus/5S, iPad Air/Pro/mini, Sony PSP/Xperia, Microsoft WP8, Samsung Galaxy series and other mainstream devices. If you need to convert any SD/HD and even 4K UHD/8K videos to the best video size for YouTube uploading or set the audio video parameters, please turn to WinX HD Video Converter Deluxe. Besides, it is an easy-to-use video/audio/DVD converter, video/music downloader supporting 1000+ sites (YouTube included), and recorder to record screen and webcam. It is an easy-to-use video audio DVD converter, a video music downloader that supports 1000+ sites (YouTube included), and a recorder to record screen and webcam. What are the best YouTube videos formats in 2018? Is MP4/HEVC the best video format for YouTube uploading, or sharing onto Vimeo, Dailymotion, NetFlix? Guide on how to trim YouTube video free with best online or desktop YouTube video cutter. Some reliable free YouTube video cutter/editors are provided here. Here you'll learn how to free download YouTube videos (HD/4K) to computers, mobiles or other devices for offline playback, video editing, etc.